The #NotSupported event at the VMworld Community Lounge ended with a very special presentation by our very own Randy Keener about a project that a few VMware engineers have been working on called Nanosphere. For those of you who could not make the session or attend VMworld this year, here is some additional information about what Project Nanosphere is all about. First off, Nanosphere is not a product, it is a proof-of-concept. The idea is to make ESXi easier to deploy and manage for non-technical users in small environments (SOHO, remote/branch office, family) to get the same benefits of virtualization that enterprises have. Nanosphere provides an ultra-lightweight management layer on top of an ESXi host that will offer a basic set of features including self-configuration, VM provisioning, VM lifecycle management, and console access.Today, connecting to a VM console typically requires both server-side dependencies (a VDI broker, a Windows stack, or specialized guest customization) and client side dependencies (installing a special ActiveX browser plugin that works only on Windows, and only in IE or Firefox browsers). By deploying WSX on ESXi, it makes it possible to connect to any VM (any guest OS) with any modern browser (e.g. including iPad) without any special software. 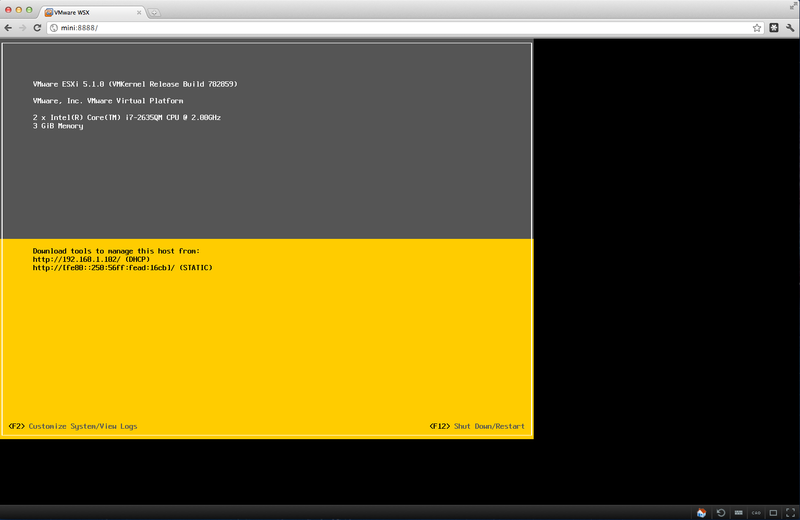 The physical host has ESXi and Nanosphere installed. You "unbox" it (take it home from Staples) and plug it in on your home LAN, headless. It gets DHCP but you have no idea what the address is because it's headless. 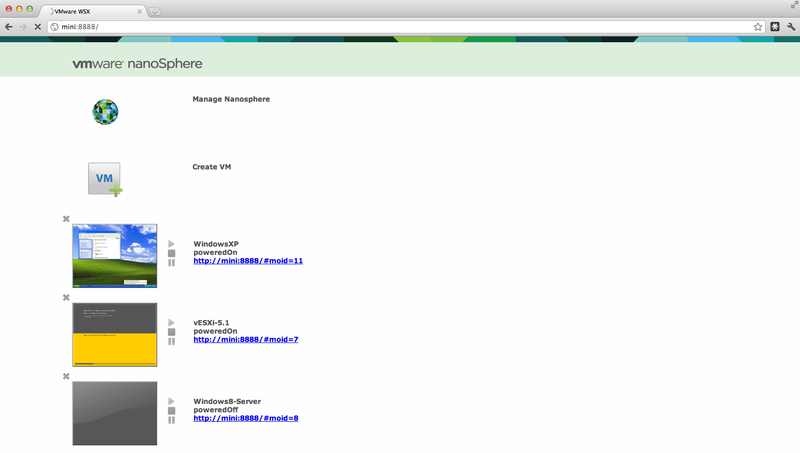 Nanosphere "phones home" to a broker running at nanosphere.cloudfoundry.com (custom application written on Cloudfoundry) to report its local LAN address (e.g. '192.168.0.4') and its UUID. The broker also records the WAN address. You use a plain browser on any device on the same LAN - we used an iPad - to connect to the same broker. It matches the WAN addresses and redirects the browser to the Nanosphere’s LAN address. As mentioned earlier, nanosphere is still a proof-of-concept but the VMware engineers have some interesting ideas on where it could go and would love to get your feedback if the following use cases interests you. Other work includes tracking ongoing WSX improvements. If any of these use cases interests you, please leave a comment below or if you have other ideas/feedback for Nanosphere, feel free to leave a comment as well.I think the Nanosphere project is a really cool initiative and hopefully we will get to see more in the future. I wanted to also give a big thanks to folks who worked on the Nanosphere project and made it possible to show off at the #NotSupported event: Steve Strassmann (VMware Staff Engineer), Shivam Tiwari (VMware Intern) and of course Randy Keener (VMware TechOps) for presenting on Project Nanosphere! You now have a pint sized, scalable, instacloud. Sounds great, really looking forward to it being released. I’m running a single ESXi (free license) and have been using the Ghetto webAccess Greasemonkey script and WSX (running on a Linux VM on that ESXi) for a while now due to the lack of a single web GUI like Nanosphere. Nanosphere does not need to be a full vSphere Client replacement — there will always be things that are best done in a native app, but it would be really useful if the everyday stuff (i.e. remote control and power control) was available through a web interface. I’m really impressed by what Nanosphere can do, especially by automatic network configuration without ever typing an IP address. Your VMware engineers have done a great job. Thanks a lot for sharing with us these very interesting datas.